It was August 22, 2014, and Joyce Dickerson was just getting warmed up. The crowd at Hilton Head Island was roaring its approval as she ticked off her objectives. It was a broad list of issues ranging from improving veterans’ care to ensuring equal pay for women, but they all had one thing in common: across-the-board opposition from the unelected man she’s vying to replace. “His views don’t match up with the people of South Carolina,” Councilwoman Dickerson said of the appointed GOP senator Tim Scott, who will face voters statewide for the first time this year. It was an unapologetically progressive message for a Senate candidate running in what is considered to be a safely GOP state. But Mrs. Dickerson laid out her vision without a hint of equivocation, and left the rally with some true believers in her wake. It’s a clear, concise, and popular agenda – and it’s been enough for her to win over the support of one in three South Carolinians without running a single TV ad thus far. That’s a remarkable feat for a political unknown, but Joyce Dickerson is just getting started. It’s a winning streak that Dickerson is fighting to extend through November, with the loftiest goal of her career in sight. She’s already the only female African-American nominee for Senate running in 2014, and this November she can make history again by becoming South Carolina’s first woman elected to the office. The Hilton Head island in Beaufort County is located in the the southernmost tip of the state, and it voted heavily for Mitt Romney. It’s the most unlikely place to host a Democratic renaissance. But that’s exactly what happened last month, as a new campaign office was unveiled with both Democratic nominees for Senate giving feisty speeches as the local activists plotted a path to victory. Paul Russo is the president of the Sun City Democratic Club. It’s the most heavily populated city on the island, and generally a Republican stronghold. But he’s seeing signs of life for his party this year. But could this year be different? A historic bench of black Democrats has been tapped to lead the ticket, causing speculation that the most powerful demographic in the state’s Democratic party might be out in force this November. Vince Sheheen, the Democrat who shocked observers by coming within a whisker of defeating Governor Haley in 2010, is again at the top of the ticket. This time, he’s benefiting from hundreds of thousands of dollars in spending from the Democratic Governors Association, and polls show a close race. Brad Hutto is another rare white Democratic lawmaker in the state who is challenging Senator Lindsay Graham this fall. But the rest of the field is dominated by black Democrats. 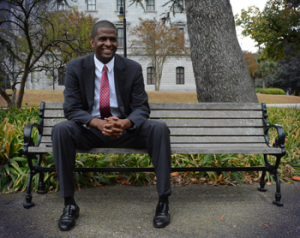 State Representative Bakari Sellers is a rising star who has been tapped to run for Lieutenant Governor. Tom Thompson is waging his own statewide campaign for Superintendent of Education. And Joyce Dickerson is at the vanguard of the African-American surge, having won a competitive primary with an overwhelming 65 percent of the vote. But the resounding primary win – which elevates her to the highest-profile political battle she’s ever fought – isn’t the biggest honor she’s had in her life. That distinction came in March 2013, when Dickerson was elected as Chair of the National Foundation for Women Legislators. Her installment in the organization was a source of tremendous pride for her personally, but what especially moved her about it was the reaction in South Carolina. It was a wonderful and uplifting bipartisan event held at the lawn of the Governor’s Mansion. But in the celebration of the group promoting women in politics, one person was inexplicably absent: Nikki Haley, herself the first woman to serve as South Carolina’s Governor. To this day, Joyce Dickerson does not know why Haley didn’t drop by, or at least send her regards. “I never heard from her,” she said simply. Her tenure as Chair of the NFWL has been Dickerson’s proudest achievement in her political life thus far. But it’s only one chapter in the illustrious career of a 68-year-old public servant who isn’t finished fighting. Dickerson’s involvement in the state’s government stretches back decades. She’s been on the executive board of the Central Midlands Council of Governments. She’s a former chair of the Administration and Finance Committee. 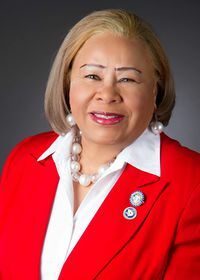 She’s served on the Telecommunications and Technology Steering Committee, and she’s a former president of the Women Officials of the National Association of Counties. And then there’s the near-decade she’s spent on the Richland County Council. Over nine years, she’s been elected and re-elected resoundingly. That may not be surprising in a heavily Democratic county that gave the President 65% of the vote, but it’s important for her statewide election prospects. In a low-turnout midterm election, Dickerson will be able to count on a strong base in South Carolina’s third-largest county. The main obstacle is money, and the campaign’s financial woes are rooted in the stunning indifference from national groups. Dickerson’s campaign has inexplicably and inexcusably been ignored (so far) by national women’s groups, while the Democratic Senatorial Campaign Committee has not bestowed its endorsement, despite the fact it costs them nothing to endorse a scandal-free and competent challenger. EMILY’s List, the national organization promoting the candidacies of pro-choice women, also has not given an endorsement. Meanwhile, the candidate is a happy warrior on her shoestring budget. She travels across the state in her green Ford Explorer, puts up her own signs by intersections, and coordinates with county chairs when she can, hoping to build up a grassroots army that makes up for a cash-starved campaign that can ill-afford TV ads. Joyce Dickerson and the other candidates running statewide may be waging uphill battles this year. But they each have an unwitting ally: South Carolina’s Republican Party. The state’s political establishment was rocked last week with the news that the powerful Speaker of the House, Bobby Harrell, has been indicted on charges of embezzling campaign funds. He suspended himself from office, prompting a change of guard in Columbia. It’s part of a pattern for high-profile GOP leaders in the state, as then-Lieutenant Governor Ken Ard was forced to resign in 2012 after pleading guilty to seven ethics violations. His resignation cleared the way for Glenn McConnell, an avowed champion of the Confederate flag, to fill the position. But the action didn’t stop in the House. Jordan Bryngelson, the GOP Chairman of Dorchester County, was also indicted last week on one count of forgery. With a population of 136,000 people, Dorchester is an important part of the state’s political balance, and the scandal is another headache for a party with a vulnerable governor, and a senator in Tim Scott whose political strength is just theoretical. 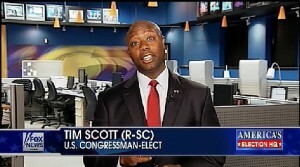 Tim Scott has endured only one statewide contest in his career: the GOP Senate primary in 2014. He won it with 90 percent of the vote, a margin that was supposed to dispel doubts about his hold on the Republican electorate. But there’s no glory in triumphing over weak opposition, and Tim Scott’s competition for the GOP nod was less than nominal. His opponent Randall Young filed as a candidate, but did no campaigning. It’s a head-scratcher in political circles. Why would someone pay the $10,000 fee to file as a candidate, collect the necessary signatures… and then go off the grid for months? One thing is clear: The mysterious phantom-challenger wasn’t bad for Tim Scott. It allowed him to coast to victory and point to an 80-point win as proof he’s a conservative in good standing. But what about the 10 percent who still opposed him? Scott had better hope that that slice of the electorate represents GOP voters who weren’t familiar with either candidate. It seems highly unlikely that voters who bother to turn out for the primary wouldn’t know who they were voting for, but the alternative explanation is far worse for Scott. If that slice represents the share of the GOP electorate that will stay home rather than support a black candidate, than his sweeping victory still spelled trouble for his campaign. In the meantime, Scott can take comfort in the fact that his relative anonymity statewide is still better than the status reached by South Carolina’s most famous politician. Former governor Mark Sanford is in the news again, in a week during which his mistress disowned him while his ex-wife asked a family court judge to order him to undergo psychiatric evaluations. Given the events of last week, it seems like a very reasonable request. Jenny Sanford didn’t deserve to be embarrassed, and neither do the voters of South Carolina. But embarrassed they are, by both a former governor’s narcissistic antics and a state party that’s rapidly unfolding as a clown show of corruption. Maybe the judge will think of them, grant Mrs. Sanford’s wish, and then go a step further – ordering psychiatric evaluations for the entire state GOP. ← War of 1812 celebrant asks: So you think you won the war, eh?